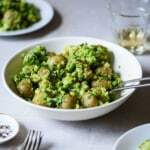 This gorgeous recipe for smashed new potatoes with peas is slightly adapted from Yotam Ottolenghi’s latest book, Simple (Ten Speed Press, 2018). Bring two pots of water to a boil: a large one and a medium one. Generously salt the large pot of boiling water and add the potatoes. Cook for about 15 minutes, or until soft. Meanwhile, add the peas to the medium pot of boiling water and cook for 1 minute. Immediately drain into a colander and run the peas under cold water. Add two-thirds of the peas to a food processor and set the rest aside. Rinse the preserved lemon. Cut it into quarters, scrape out the flesh, and discard it. Slice the rind and add it to the food processor with the peas. To the food processor, add the cilantro, oil, lemon zest and juice, garlic, rounded 1/4 teaspoon salt, and lots of black pepper. Pulse to form a rough paste. Drain the potatoes and place in a large bowl. Lightly crush them with a potato masher. Add the pea-cilantro mixture and the whole peas and toss to combine. Taste and adjust the seasonings if needed. Garnish with cilantro and serve warm. The potatoes should be about 1-inch in diameter. If yours are bigger, halve or quarter them before cooking. Preserved lemon adds a perfume-y aroma to the dish. They’re typically sold in a jar in the international foods aisle of the supermarket. But if you can’t find them, just add more fresh lemon zest and juice than called for.